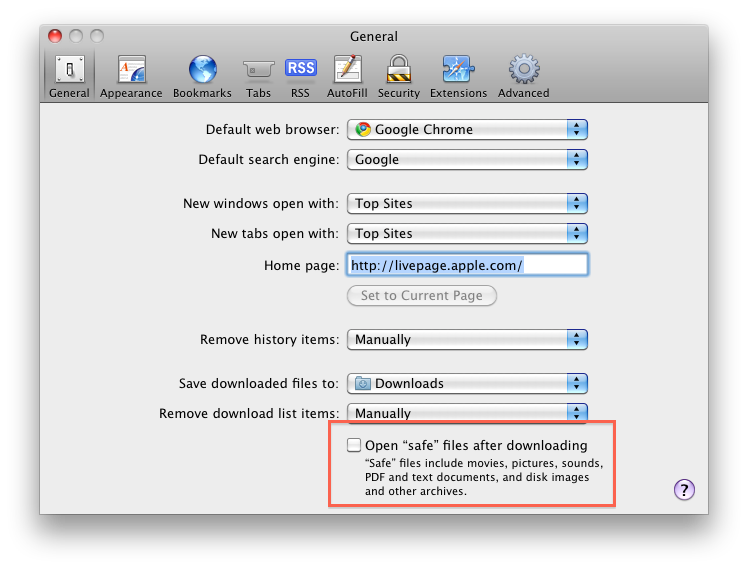 Safari unzips .zip and .gz files after downloading. How can I stop this behavior? In the menu bar, go Safari -> Preferences. In the "General" tab, uncheck "Open 'safe' files after downloading". This will stop Safari from automatically unzipping the files. Just hold the ⌥ alt button while clicking on the download links. Tested on OS X Mavericks. In Preferences, at the bottom of the General tab, uncheck the "Open "safe" files after downloading" check box. Check out this article if you want to keep the "Safe Downloads" behavior but tweak it a little. How do I stop Safari from occasionally downloading “mlingos9.html”? Why does unzipping via Finder set execute bit on text files? Prevent Safari 10.x from auto-downloading files?